"The fires of Isengard will spread. And the woods of Tuckborough and Buckland will burn. And, and all that was once great and good in this world will be gone." Music by Marion Zimmer Bradley, Kristoph Klover and Margaret Davis. Performed by Brocelïande. Recorded at Flowinglass Music. Being a Lullabye, you think of quiet, soft music; it’s not exactly like that. The musical instruments used are recorders, cello, zils, and a field drum that comes in later and provides a nice dancing beat. It is a typical folk-sounding track, and you just have to dance to it. This is one of the happier Elven tracks, and one of my favourite songs on the CD. This is a slower track, and quite relaxing. Not one of my favourites, but nonetheless, a good take on the poem. Nylon and wire strung Celtic harps provide the relaxing tone. This has a nice walking pace, and the two singers (Kristoph Klover and Ernest Kinsolving) sing one verse each, then start again, singing together the first verse. Then there is just music with recorders, an acoustic bass and mandola, and then they start again, but this time in a round. No musical instruments come in, until the second verse, and then it is only a Celtic harp, then bringing in the other instruments in the break between the singing. It is a truly great song to sing if you’re travelling–especially if you’re doing something like camping. This is indeed a Merry track! Another of my favourites, it is hard to keep a smile from your face, when listening to it. A fiddle brings a happy note, while a 12 string guitar provides the chords, and a jaws harp, a whistle and a recorder provides the rest. Trust me–you will want to get up unto a table and dance. If you have an old, pub near you, that takes joy in folk music, and dancing etc., you should think about going there. This has a typical, almost marching beat, played on a snare drum. It is not one of the best songs on the CD, and I usually skip it, but it is a good track, and is by no means a bad take on the poem. This is definitely an unusual take on the song; it is not sung sadly, it sounds as if it is recounting memories, and is a 12 string guitar provides most of the backing. The tempo is not very slow, but it is not something you can merrily dance to–imagine more of a moderate dancing-with-another speed. By no means has this song got a haunting, Elvish voice. But the voice is good, and the beginning and the end of the of the song has a haunting backing, provided by a synthesizer. Sometimes these can ruin a song; but it has provided a nice sound. A flute comes in occasionally, reminding you of falling leaves. A harp provides extra backing. The song is slow, but not as slow as what you expect from a lament. It only truly slows down on the last few seconds of the song. Now (laughs slightly), I can’t exactly imagine Sam singing with such a voice…well, I can, but it is, indeed, quite strange. The instruments used are, yet again, a 12 string guitar, bass, Mandola, Celtic harp, and……..spoons. Which you can hear, and do provide a nice touch to the song. The tempo is quite fast, and is a really Hobbit sounding song. This is another song that makes you smile. This whole song has a very solemn, grim sound. The instruments used are a field drum, a Celtic harp, and a French horn. A man named Karl Franzen provides the vocals for the first verse, Deidre McCarthy singing on the second verse, and both singing on the third and final verse. The song starts with the harp playing a continuous chord, and a melody comes in over the top, when the wind is replying where it last saw Boromir. When the second verse comes in, a field drum starts up, and it gives the song a wonderful beat. The French horn comes in on the third verse and provides a majestic and solemn backing. It is one of the longest songs on the CD, at 5 minutes, 49 seconds, but is an awesome interpretation on the poem. It is another of my favourite songs on the CD. Unusually, what I thought was going to be one of my favourite songs on the CD, turned out not to be. It has grown on me, but the backing vocals are a little deep, and…..well….strange. But it does put I smile on my face now. It is the shortest song on the CD, at 2 minutes, 13 seconds, and has a typical, cheery, Hobbit sound. A harmonica provides a good tune, along with a recorder, with spoons and a 12 string guitar giving the backing. You can just imagine Pippin in the bath! Don’t take that the wrong way, know. A Celtic harp, 12 string guitar and drum provides the music to this song. “Orchestral bits” as they call it, come in now and again. The song has a medium tempo, and does sound slightly Dwarvish. It has an interesting sound, and good vocals. A good take on the poem. This song is another of my favourites. 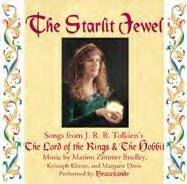 Good harmonies with the vocals, a Celtic Harp, recorders, Mandola and Cello all come together to give this song a lovely Elven sound. The recorder starts the song with a high, beautiful sound, and then stops as the Celtic harp and vocals of Margaret Davis comes in. When the song has reached the point of being just under 2 minutes, the male vocals come in, to back up the leading vocals. The singing then stops, as the recorder comes back in, with its beautiful tune to go over the harp accompaniment. Then the leading vocals come in once again, soon to be joined by male vocal harmonies. A wonderful song. To tell you the truth, I really don’t know what to make of this song. The verses where the Ents are singing are different to the beat in the verses where the Entwives sing. The last verse almost combines the two, as they are both singing. A cello, guitar, recorder and bouzouki are the instruments used. For some strange reason, I can always imagine Boromir (When played by Sean Bean) singing this……don’t ask me why. But anyway, this is not one of my favourite songs on the CD, but it’s all right, even though it is not what I expect the Ents to sing, because of the beat. Overall, I think this is a good CD, a good buy. You do have to have a certain taste for folk to enjoy it, and at least a tolerance for certain types of voices.